Serves 6-8, takes 2 hours. This Italian-style meatballs recipe was from The Food Lab by J. Kenji Lopez-Alt. 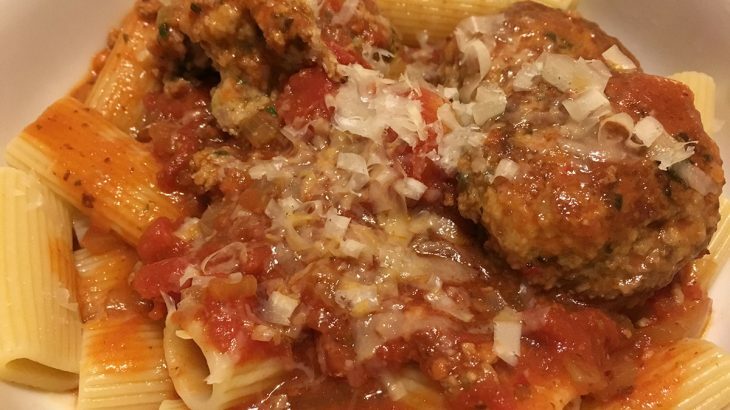 It yields a large amount of delicious, classic Italian-American meatballs. The meatballs are served with a rich tomato sauce. It takes quite a bit of time to make the meatballs, so plan for making them on the weekend. 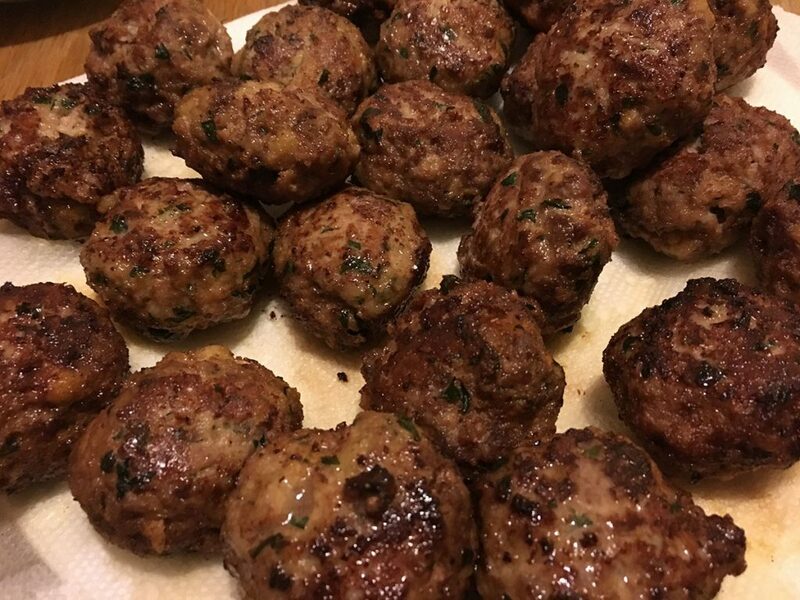 You will have a lot of meatballs, but they can be served in several ways (e.g., with pasta or in meatball sandwiches topped with melted mozzarella cheese). I also recently ate meatballs with tomato sauce at Davanti Enoteca in the little Italy neighborhood of Chicago that were served over a pile of sautéed Swiss chard. 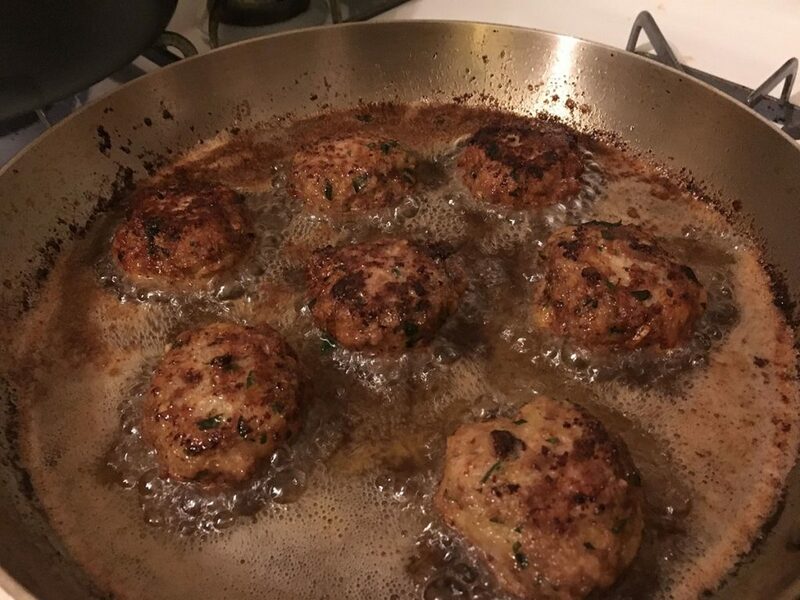 The acidic, garlicky greens perfectly cut the rich flavor of the meatballs. 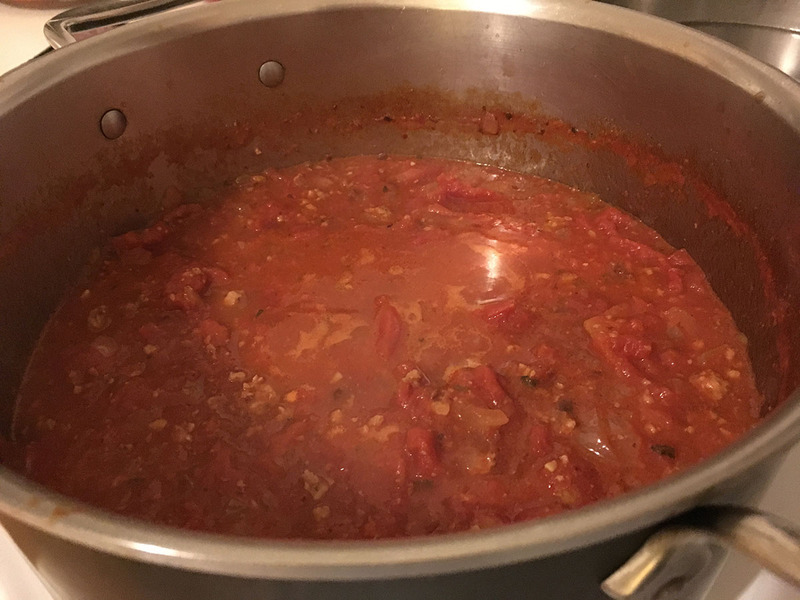 We sopped up the tomato sauce with artisan Italian bread. I think this is a great way to serve meatballs, as an alternative to having them over pasta. This recipe calls for Marmite, which I did not have. I believe it is included in the recipe to add additional umami flavor. I left it out and the meatballs were still delicious. Umami in this recipe is conferred by the mashed anchovies and soy sauce. Chop ½ onion and mince 2 cloves of garlic. Coarsely chop 1 bunch of greens. Sauté onion over medium-high heat until soft, about 5 minutes. Add garlic to pan and cook onion and garlic for 1 additional minute. Add chopped greens and cook until greens are completely wilted and tender (varies depending on greens, for instance kale takes a lot longer than swiss chard). Turn off heat and squeeze lemon juice (to taste) over the greens or add 1-2 teaspoons of sherry vinegar. Hello,I read your blog named “Italian-Style Meatballs – A Girl And A Knife” daily.Your writing style is awesome, keep it up! And you can look our website about proxy free list.